All Tomorrow’s Parties return to New Jersey, Curated by Greg Dulli | extrawack! 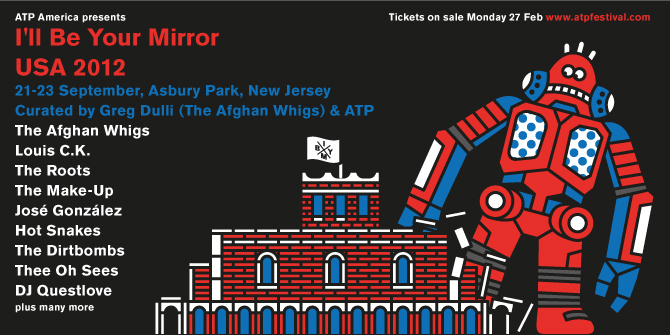 The awesome folks at ATP have announced dates and talent for a new I’ll Be Your Mirror event in Asbury Park, NJ, the Saturday night of which will be headlined by The Afghan Whigs (who have reunited after a 13 year hiatus) and curated by their frontman Greg Dulli. Dates are Friday, September 21st through Sunday the 23rd, and tickets go on sale this Monday At 10AM EST via www.ATPfestival.com. Three-day passes are priced at $199 for the weekend, until March 27 when any remaining tickets will go up to $249.